Pressure is something Marcus Mariota knows well. From his days in college, he understands that his team’s successes and failures will all fall on him. He understands how to thrive in situations when everyone is looking to him, needing him to come through when it matters most — either on the field or in the community — whether that means working at a Boys’ Club or Girls’ Club or throwing touchdowns in the Rose Bowl. Now in the NFL, he faces a whole different kind of pressure. The Ducks and Titans both have a lot riding on Mariota’s future. His career and reputation are not the only things on the line as he enters his rookie season for the Titans. 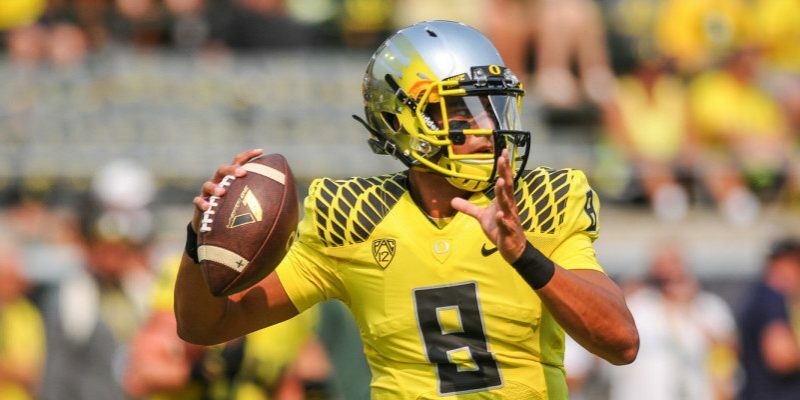 Everyone from his coaches in Nashville, who have their careers riding on his success after selecting him with the second pick, to fans in Eugene who know that in order to maintain an elite brand for Oregon football, Mariota needs to succeed to prove that Oregon can put elite players, especially quarterbacks, into the NFL. 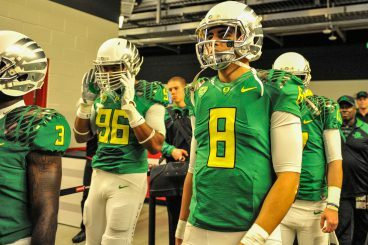 So how has Mariota fared in his first few months as a professional? The first real step for any NFL team is the first round of OTA’s, a voluntary set of practices where the offense and defense start to learn general concepts in mostly non-contact drills. For rookies, this represents the first opportunities to practice with their new teammates and to try to grasp their new lives in the NFL. For Mariota, this represents his first taste of things such as calling plays in a huddle, taking snaps from under center and running a pro-style offense against elite NFL defenders. Most rookies experience a learning curve, and some expected Mariota’s to be especially steep due to his college experience in a high-tempo spread offense and an assumed lack of experience in pro-style offensive concepts. So far, however, his coaches have been pleasantly surprised by his performance. In an interview with ESPN’s Paul Kuharsky, Titans quarterbacks coach John McNulty was especially high on his footwork and his ability to throw on the move. He attributes these to Mariota’s natural athleticism. John McNulty praised Mariota’s ability to throw on the run, something that has long been a strong part of his game. Marcus didn’t take long to impress his teammates either. After only his first practice, he did enough even to earn the respect of members of the team’s defense. Zack Brown was not the first or last to lose Mariota due to his speed. While Mariota has impressed many with his natural feel for the game and his easy-looking athleticism, he has not been perfect. He is still adjusting to calling plays in the huddle and more importantly adjusting to the elite athleticism of defenders in the NFL. In an interview on radio station The Midway 180 last week, the former Oregon quarterback described a particular play in practice where he was attempting to throw a seam route to an open Kendall Wright that was broken up by an incredible play by Brandon Harris. “It definitely was an incredible play on his part. 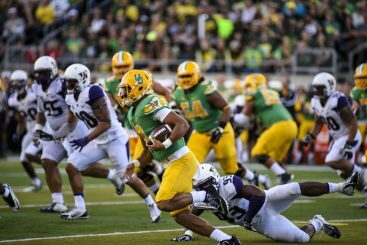 His ability to react to that throw was something that you’re not really used to seeing in college,” Mariota said. Plays like these show why fans have to be patient while watching Mariota’s early career unfold. There will be outstanding moments when he does unbelievable things even his coaches and teammates will be surprised by, but there will also be moments where a throw he’s been able to make his whole life is suddenly taken away by the elite defenders on this professional stage. Mariota’s career, however, is on the fast track to success. He’s impressed his teammates and coaches through his play in the team’s first few practices, led the league last month in jersey sales, and has the entire support of the Titans organization behind him. He’s the center of a massive marketing campaign all over Tennessee, involving several large billboards that have used his face to sell season tickets. While Mariota will likely struggle at times — as all rookies do — the Titans have a special player on their hands, and the coaches and players know it.